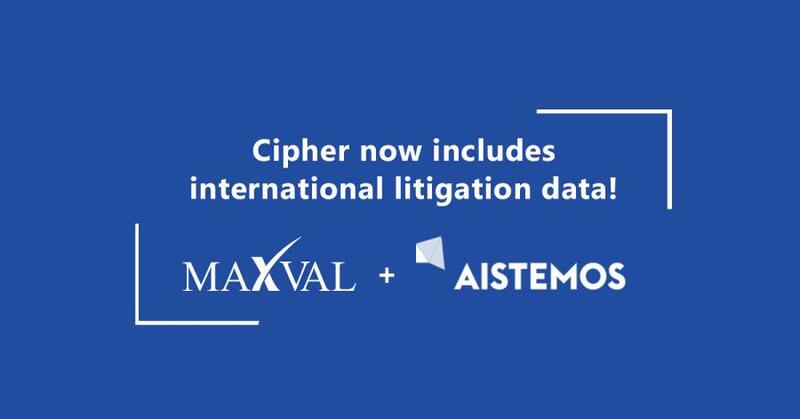 LOS ALTOS, CA, UNITED STATES, April 3, 2019 /EINPresswire.com/ -- MaxVal, a global intellectual property solutions provider, and Aistemos have partnered to provide additional litigation data for Cipher, its advanced patent intelligence software. In addition to the existing US litigation data, Cipher users now have access to litigation data for China, Germany, France, Japan, UK, and the Netherlands. “As patents become more important to more companies in more sectors, transparency and accessibility of international litigation data is becoming an essential part of the picture. Europe and Asia are key jurisdiction on the global IP stage and MaxVal is to be congratulated for building this database” Nigel Swycher, CEO and founder of Aistemos. This dataset will be of interest to all companies who are managing their litigation risk, whether through IP insurance, organizations such as LOT Network, or strategic planning. “IP litigation data is an important component for understanding the risk when offering our IP insurance, and we are delighted that more international data is now available,” said Erik Alsegard, IP insurance lead at CFC Underwriting in London. “The NPE problem has not gone away as they still file 2,000 new lawsuits per year in the US. On top of that, we are seeing more of this type of litigation in Europe and Asia. It’s great that Cipher is making use of this additional data to provide transparency,” added Ken Seddon, CEO of LOT Network. MaxVal is a Silicon Valley-based IP solutions provider, known for its cutting-edge products and automated solutions. Since 2004, MaxVal has been providing technology-enabled solutions and expert services to IP professionals, enabling IP counsels and their operations teams to increase efficiencies, scalability and quality. MaxVal’s Litigation Databank allows you to proactively monitor and query whether patents of interest have been litigated. Users gain analytical insights on plaintiffs, defendants, filing trends, courts, and more. Cipher patent intelligence software delivers the analytics needed to support strategic IP decisions. Cipher is the market leading solution using artificial intelligence and machine learning to provide automated mapping of patents to technologies. Cipher is the only software which can be customised to a company’s own taxonomy, in addition to providing comprehensive industry libraries, including Cipher Automotive for OEMs and suppliers and Cipher n/d Powered by AST for technology cross-licensing. MaxVal is a silicon valley-based tech-enabled managed solutions provider known for its cutting-edge products and automated solutions. Since 2004, MaxVal has been providing technology-enabled solutions and expert services by partnering with patent counsel and patent operations teams to optimize patent lifecycle management with high levels of customer service. MaxVal’s clients range from start-ups to Fortune 100 companies including, top U.S. pharmaceutical, biotechnology, high-tech (wireless, electrical, electronic, etc. ), medical device manufacturers and leading technology-focused patent law firms worldwide. MaxVal’s team comprises highly experienced and IP-trained professionals who have been delivering IP related solutions for more than a decade through continuous process innovations and state-of-the-art technologies.